The University of Alabama Museums (UA Museums) and The University of Alabama Center for Economic Development (UAECD) are launching the Alabama Indigenous Mound Trail. The sign-unveiling and program-launch will take place this Friday, October 5, at 1 p.m. at the Moundville Native American Festival’s main stage. Next year the State will celebrate its bicentennial, but Alabama’s heritage began long before 1819. The Alabama Indigenous Mound Trail (AIMT) celebrates the cultural heritage of our region through highlighting 13 archaeological sites that allow people to learn more about the depth of time and culture that began long before Alabama achieved its statehood. The AIMT provides an opportunity for Alabamians and out-of-state visitors to enhance their understanding and appreciation of the purpose, function, and significance of the ancient indigenous mound centers located around our state. The mound sites are scattered across Alabama, and are either publicly accessible or have public parks nearby that offer opportunity to educate visitors about the site. and Moundville Archaeological Park (Moundville), the most extensive mound site in the region. 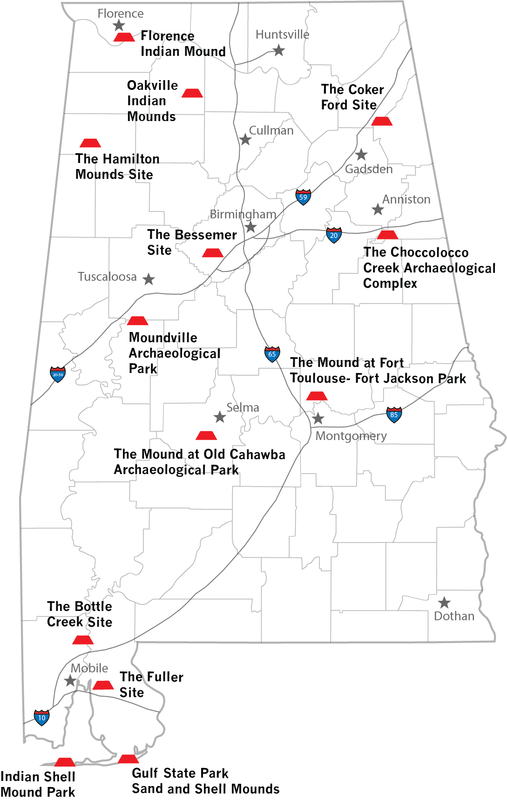 Through this program, UA Museums and UACED staff are working in collaboration with the operators of each site, regional councils of government, consulting tribal nations, the Alabama Bicentennial Commission, and other partners to inform citizens and visitors of the rich indigenous cultures that populated Alabama for thousands of years predating statehood. The program highlights and celebrates our state’s ancient monumental architecture and includes information about each site via interpretive signage installed at each location, brochures available at tourism information centers around the state, and information available on social media and our website at alabamamoundtrail.org. Site dedication events will occur around the state starting in fall 2018 and extending through 2019. For information about these events, visit the Alabama Indigenous Mound Trail Facebook page.